I was invited for a private viewing of the show as a part of #DisneySMMC program in February, but, as usual, all opinions are my own. 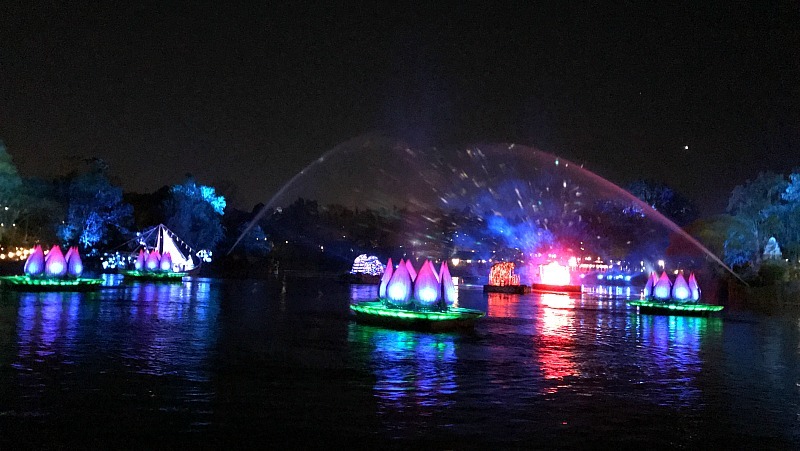 It was a much anticipated preview for us, when they announced that they had closed Animal Kingdom for our private dinner/party and we would be enjoying as the first public audience to preview Rivers of Light Show! 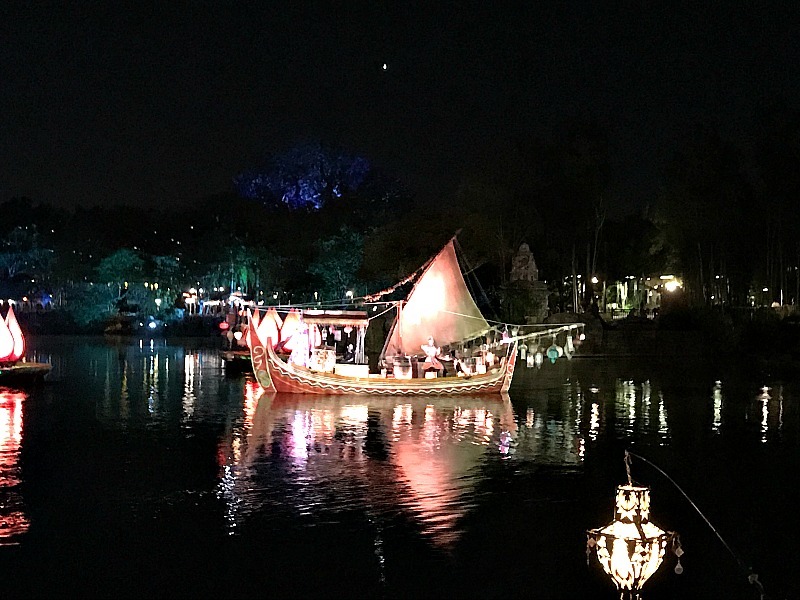 The latest nighttime offering at Disney’s Animal Kingdom, which officially debuted at the park last week! 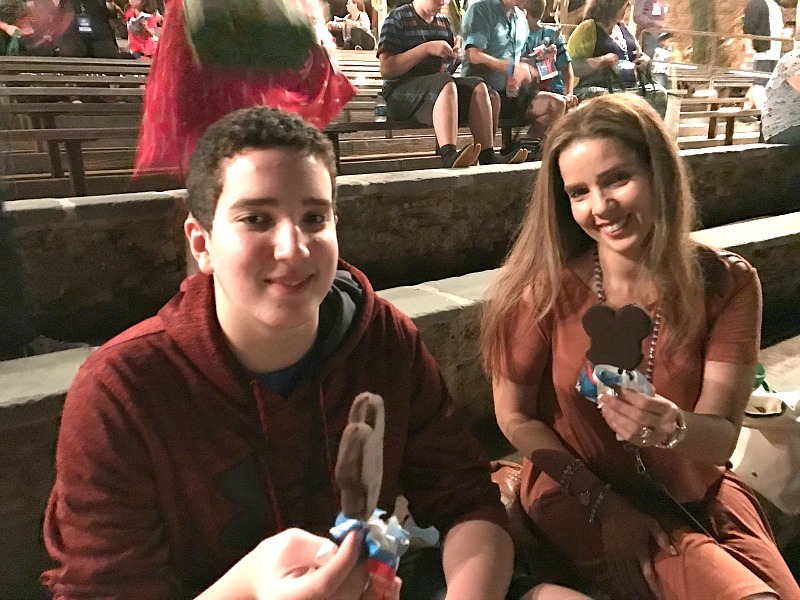 As our Travel Tuesday segment, we would like to share why we loved the show and it is a must see, when you visit Disney Parks! 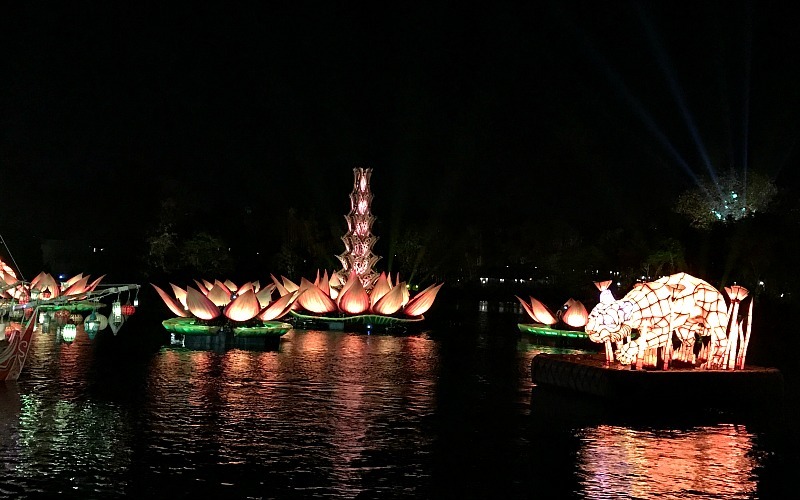 We loved that “Rivers of Light” combines live performances, floating set pieces, music, beautiful fountains and so much more in a celebration of the relationship between humans, animals and nature. This is the first thing we saw, the beauty of the floating pieces that looked like paintings fading in the night! Each Animal Spirit Guide represents a different element: An African Elephant and her calf embody Earth; a Turtle and her baby signify Water; a Great Horned Owl and her owlets symbolize the Sky; and an Asian Tiger represents Fire. 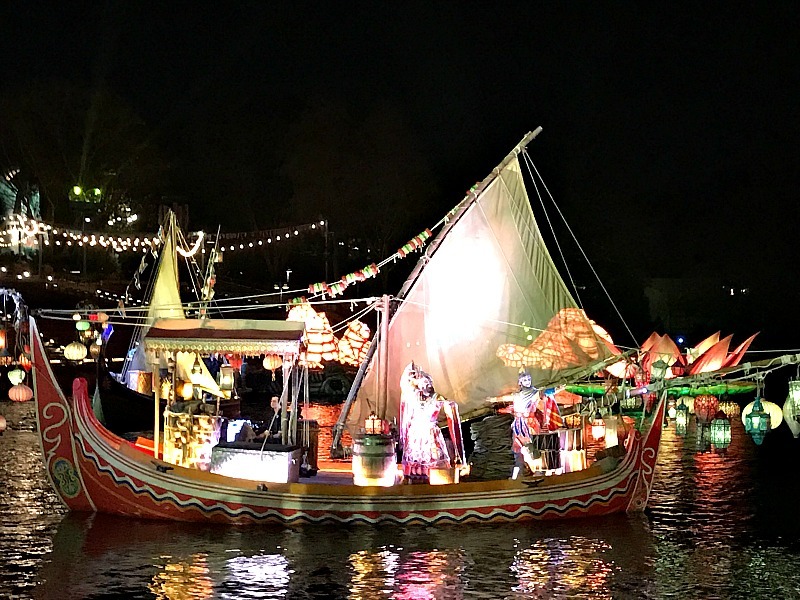 As the show begins, Aseema and Aditya, set out on their vessels to bring the gift of light to the river. They tell their stories on their respective sails using intricate Balinese shadow puppets of each of the four creatures. 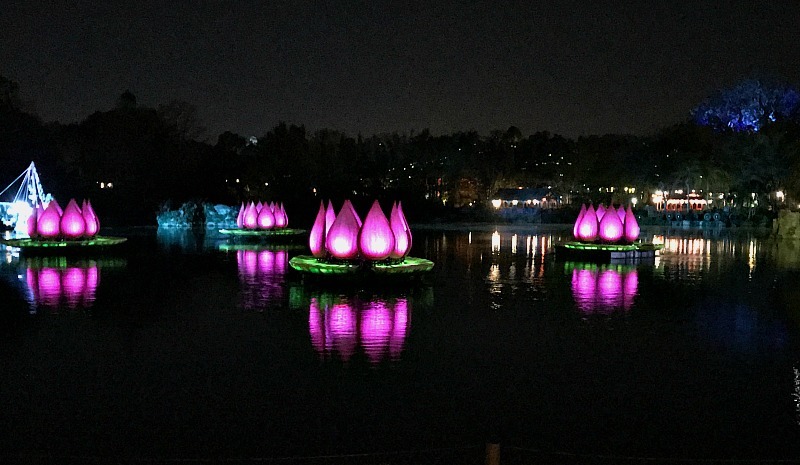 The Animal Spirit Guides are then brought in the form of four, Asian-inspired lantern floats. As they make their way across Discovery River, each animal springs into life and travels across the river’s glowing water falls. 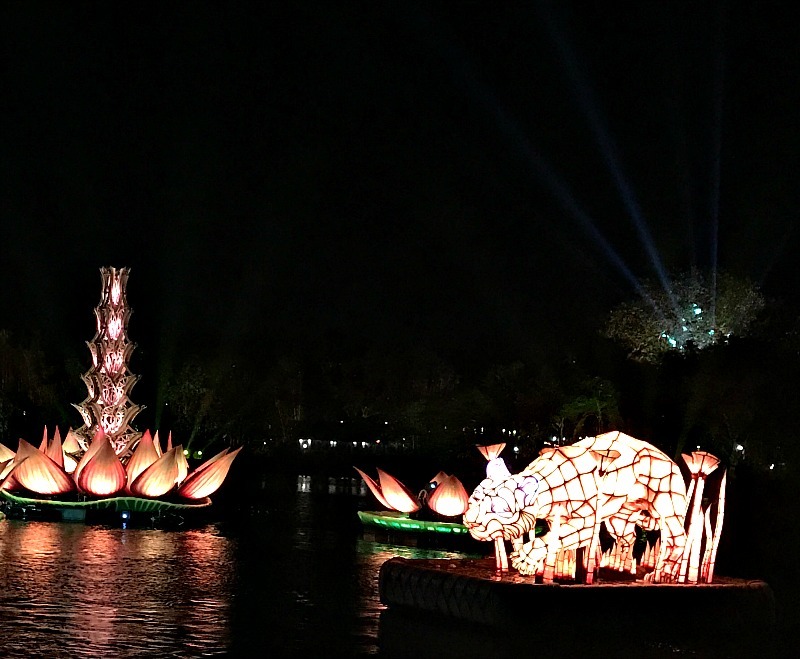 The Animal Spirit Guides then lead us through a visual celebration of earthly and ethereal animal realms – Asian jungles, African savannas, tropical oceans, North American mountains – ending in the Aurora Borealis (known in some cultures as the sky’s “Rivers of Light”). You can make reservations by visiting DisneyWorld.com/dining or calling 407-WDW-DINE. To make dining or FastPass+ reservations for the new show, visit MyDisneyExperience.com or the My Disney Experience app. (And don’t forget, the show, which is included in theme park admission, also offers standby seating). I had the pleasure of sharing some moments live with my community! So truly honored to have witnessed such a beautiful display of color, light and water, having a strong story telling behind it all, which is a mark of everything Disney Parks bring to us! My son was completely immersed in the experience! He even asked my husband, as a tech lover, about the mechanics behind water, lights and movement!! I know the show instantly became a must come back for him and our whole family! I hope you’ve enjoyed learning all about it and that you’ll check it out next time you visit the parks! As usual, give us a Trendy Shout! That is awesome! I would certainly love to watch it with my boys. We’ll put it on our bucket list. I so do want to see this! We were just there and it hadn’t opened yet. it looks spectacular. 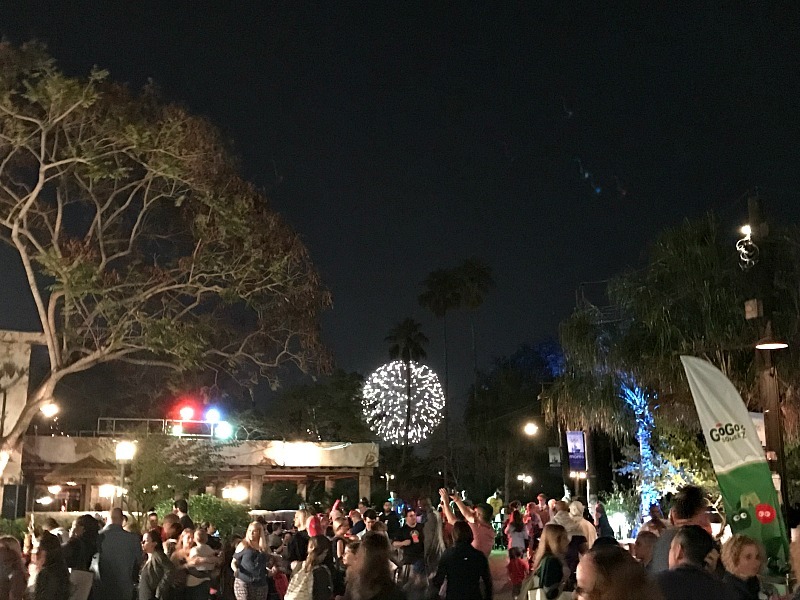 This was my favorite part about Disney SMM conference. The show is def a must see! That seemed tone a truly magical night. I was excited just looking at your post. The pictures are so inviting. This event live would be awesome. I can’t wait to see this show. The pictures look so amazing. I bet all of the children are mesmerized. This looks amazing! 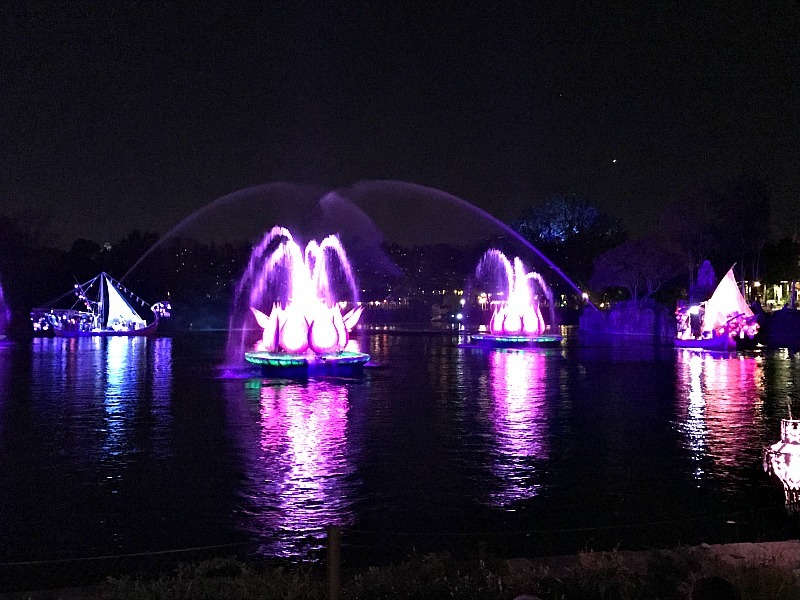 I love the light show, it seems like a great way to wind down a busy day at Disney! WOW – these do look absolutely amazing! one day we will make it to the Magic Kingdom! One day! It’s so incredible what Mickey Mouse can do! The show is truly spectacular. I know guests are all going to love it. 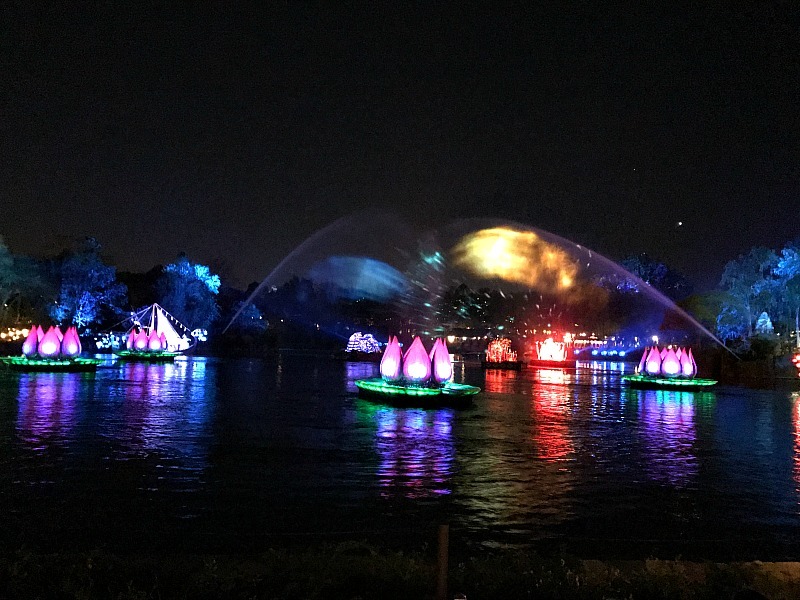 The Rivers of Light Show looks amazing!!! I can’t wait to take the family to Disney to see it. The colors and lights are beautiful. I went to DSMMC last year and they showed a preview at the conference and it looked amazing. Good to know they didn’t disappoint! I can’t wait to take my family here. This looks like such a great show at such a great place. I’m starting to make plans now!! Oh wow. This looks so beautiful. I will have to take this in next time we go there. It’s so pretty! No one does light shows better than Disney. River of Light sounds amazing. I would love to see this with the family. It’s so pretty! 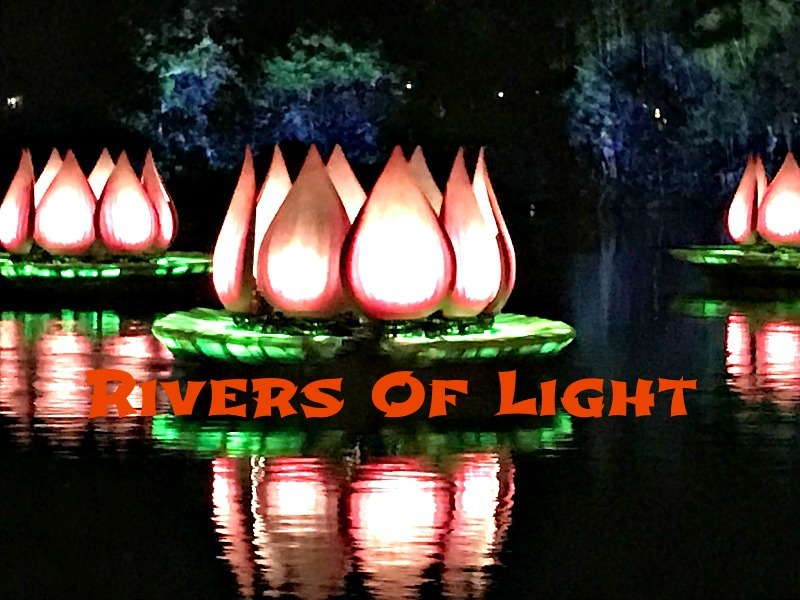 I would love to see The Rivers Of Light in person. I am hoping to go to Animal Kingdom next summer. How beautiful! It’s perfect to sit and watch after a long day on your feet. This is such a beautiful display! I love going to light shows, and this one looks amazing. So pretty! I just bought the annual pass, we will have to add it to our list to see. This looks like such an amazing show! Definitely something to enjoy with the whole family. Disney light shows are the best. This one seems awesome. We are super excited to see this one day! What a great show! 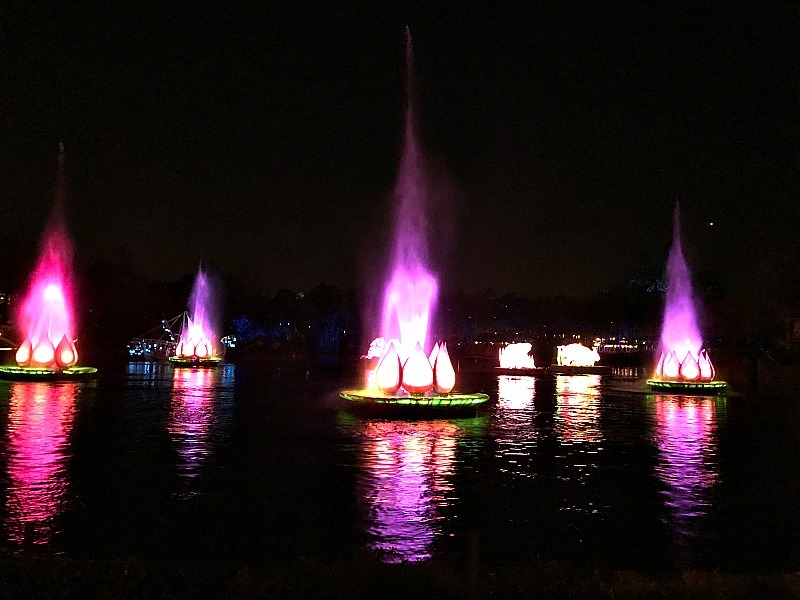 Oh my goodness, I’d love to watch rivers of light! I need to make a family vacation happen asap! This was so pretty. I can’t wait to see it again. Hoping to get to so so this weekend while at Disney. but this would have been great to see. I’ve been hearing a lot of buzz about this show. If we ever make it to Disney we’ll be sure to catch it! I will check it out when we are there in august! Sounds like a great show!